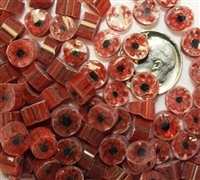 Click here to visit Lonnie's website "Pickleberries"
Flower..V69..7-8mm Flower..T36..7-8mm New Size! Flower..T01..7-8mm New! White/clear. Also available in other sizes. Flower..T55..7-8mm New! 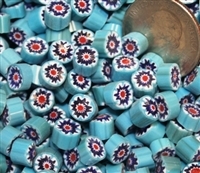 Flower..T49..7-8mm New Size! Flower..T51..7-8mm..New Size! White/yellow. Also available in other sizes. Black/white. Also available in sizes 8-9mm and 3-4mm. Flower..U56..7-8mm New Size! Flower..S22..7-8mm Flower..U44..7-8mm New! Red/black center/transparent. Mille will be a little dusty, this pic was taken after mille was rinsed. Flower..64..7-8mm..NEW Size! Flower..S98..7-8mm Flower..U38..7-8mm..New size! Orange/yellow/transparent. This is a darker orange than T57s. Yellow/red/white/cobalt/white center. There are some color variations on the outsides. Flower..T42..7-8mm New Size! Flower..S86..7-10mm New size! 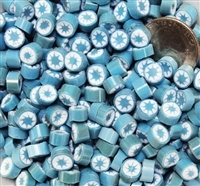 Flower..T08..7-8mm Back in Stock! Light blue/white. Also available in size 6-7mm. Almost out ~ Periwinkle blue/yellow center. Also available in size 6-7mm. Also available in size 10-12mm. Limited quantity. Aqua/white/dark cobalt center.